Lesser Black-backed Gull - First Observed by Chris Runk, January 27, 2008, White Rock Lake, Dallas Co. Lesser Black-backed Gull - December 25, 2006, White Rock Lake, Dallas Co. This adult Lesser Black-backed Gull was first observed at White Rock Lake in Dallas on December 20, 2003, by Brian Gibbons and Peter Billingham. It was photographed December 27. Lesser Black-backed Gull - Tarrant Co., November 26, 2002. Far fewer observations east of Dallas County. More than the usual number of Lesser Black-backed Gulls were noted in North Central Texas during Winter 2000-'01, including this adult at Lake Lewisville that remained from January 4-21, 2001. This adult Lesser Black-backed Gull (4th-winter?) was observed at White Rock Lake in Dallas on December 21, 2000. This adult has fleshy-pink legs - unusual for an adult bird. 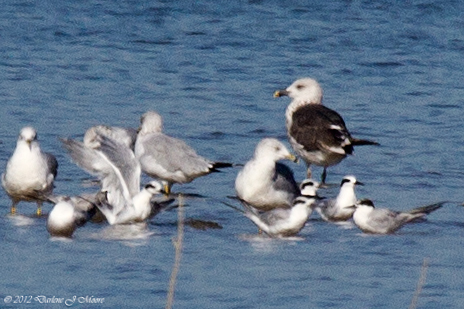 This Lesser Black-backed Gull which remained at the Greenville City Lakes from December 10-12, 2000, provided a first record for Hunt County. This adult Lesser Black-backed Gull photographed at Lakeside Park on Lake Lewisville, 1998, provided a first record of the species for Denton County.